After 16 years of “legalized bribery,” a public apology and some light grovelling. Last fall I sat down and wrote out a timeline of goals for the Ban Big Money campaign. I hoped all three major political parties in B.C. would include a ban on corporate, union and out-of-province donations in their campaign platforms before the election. I mean, how hard could that be? It’s just common sense. The BC NDP were already on side. After having this in their platform in 2013 and introducing legislation to Ban Big Money six times, it was safe to assume Horgan would include this promise in his plan for government. The BC Green Party went a step further. Knowing they would never be able to play on equal footing with the big dogs, the Greens “pulled a Bernie” and imposed their own self-regulation on donations. And they were rewarded for it, raising 93% more than they did in 2015 and breaking out of their “enviro” niche. Then there were the BC Liberals. The all-time juggernauts of political fundraising. We knew this would be a tough battle, but we never anticipated the BC Liberal fundraising locomotive would chug full steam ahead to E-Day, completely blind to what 86 per cent of British Columbians — including 81 per cent of their own supporters — were demanding. There were times when I thought we had it in the bag: when the New York Times released their exposé on our ‘Wild West’; when Premier Clark gave up her $50,000 second salary; when the BC Liberals introduced their real-time disclosure website; and when Clark introduced her “special panel.” I thought the BC Liberals were pushing to see how far they could go, recalibrating every time they realized the public could see through their political shell game and still wasn’t pleased. I expected them to continue to push right up to the end, collecting donations along the way, then introduce the cherry-on-top piece of their platform in the final weeks before the vote. Surely, I thought, they can’t lack that much common sense. Yet Christy Clark staggered on with blind confidence, or arrogance. But what do you expect from someone who has to remind herself to “Be Humble?” When asked about her party’s plans for political finance reform, her irrelevant answers included: “you should ask commuters that!” and “it’s all about creating jobs.” When directly questioned in the Leaders’ Debate about her party’s long list of scandals, Clark sidestepped so hastily that she tripped over herself, and British Columbians across the province collectively face palmed. The BC Liberals know it is no coincidence that the NDP and Greens increased their seat counts and they didn’t. They know exactly why the election turned out this way. And now, in the ironically titled “Speech from the Throne” where Queen Christy has penned her parting words, she is repenting and apologizing. It’s a bit late to say sorry. We warned the governing party countless times what the consequences would be of ignoring this issue. It’s almost like he noticed the giant billboard we put up outside his office. What’s more, the BC Liberals are essentially admitting that corporate and union donations could put lawmakers in a conflict of interest. With a new government waiting in the wings, the Liberals are suddenly keen to ban Big Money. What does that say about decision-making over the past 16 years? They know, better than anyone, how Big Money influences laws in this province. It’s not enough to close the barn door after the horse has bolted. 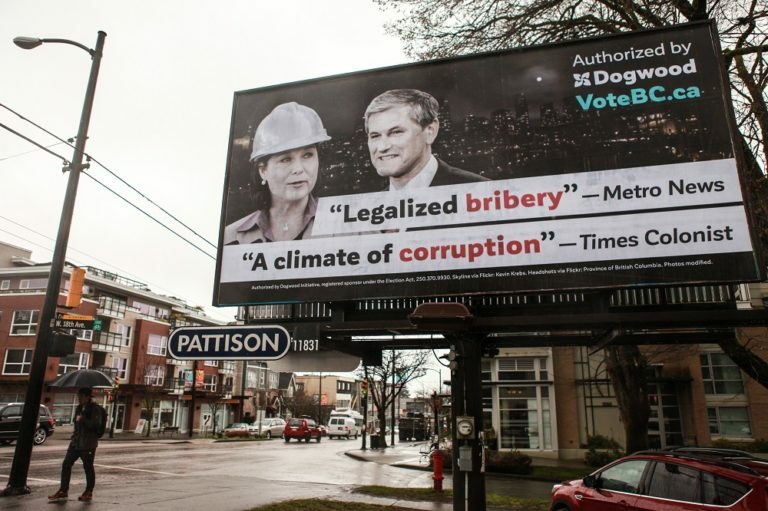 Only an independent, public Corruption Inquiry can clear the stench and restore confidence in the integrity of government decisions in B.C. But the BC Liberals are not completely reformed believers — they have a political strategy. Either they force the NDP to vote against the donation reforms they have spent the last year calling for – or they kneecap their enemies’ ability to call on unions to help erase their election debt. But British Columbians won’t be fooled by this. Premier Clark, we still remember what you said, who you listened to and who you favoured. We know you raised almost $1.5 million since May 9th. And we know you took down your real-time disclosures so you can sneak a few more big cheques under the wire. Play your political theatre. Meanwhile British Columbians will be over here celebrating. All three parties have vowed to Ban Big Money – a first in B.C. political history. The post-election grovelling is just an added bonus. We are getting political finance reform. Everyday British Columbians – 1, arrogant political elites – 0.